The tropical island of Koh Phangan is an excellent base for dive trips – both SCUBA diving and snorkelling. We go to all the top dive destinations on this side of the Gulf of Thailand. One of the most well known in Thailand is Sail Rock; this truly great dive site is only an hour’s cruise away from our dive school, and the beautiful corals and underwater life of the North tip of Angthong National Marine Park are closer to Koh Phangan than to anywhere else! There’s also lots to do here for non-diving partners, or when you’re not scuba diving or snorkelling; from retreats and yoga courses, a wide range of land based activities, to full-on partying (if that is your desire!). Our Policy with trained scuba divers is the same as on our diving courses; we dive in small groups, you get personal attention, well-maintained, correct fitting dive equipment and lots of time. After over 20 years of running our diving school on Ko Phangan, this is what our customers come back for! However you dive with us, we always provide a PADI professional to care for a group of no more than 4 divers of similar training and experience. We allow 1 hour for scuba dives (subject to safe diving practices), with a minimum hour and a half surface interval. You will get proper pre-dive briefings (and supervision of those buddy checks) as well as professional underwater care, and we enjoy a chat after the dive about the amazing marine life you saw, before helping you to log it all up! If you are snorkelling with us, we provide all the equipment you need at the dive centre and our PADI professionals are available on the boat for advice and assistance. 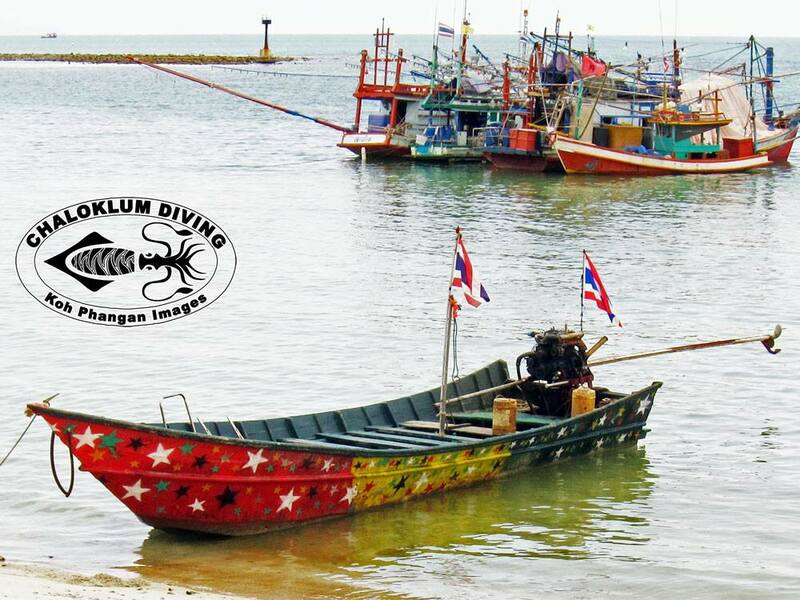 Our own Big Dive Boat means that from Koh Phangan we can visit all the best diving and snorkelling sites in our area. The boat has plenty of space, large toilet/shower, special dive gearing up area, plus front deck for sunbathing and socialising. Upstairs there’s the captain’s cabin (with radio, GPS, full 1st aid kit and O2), more sunbathing space and a large, covered dining/social area. Good food, fresh fruit, and soft drinks included! Beach Diving is usually done from our dive bases at Chaloklum and Mae Haad beaches. Due to its fascinating macro marine life, we’re exploring the Chaloklum Bay dive sites more and more. Set up your dive equipment at the beach, buddy check, walk in, and after a minute or 2 snorkelling out, you’re ready to dive. Great for beginners PADI diving courses and long relaxed scuba dives along the reef. Local “Longtail” Boat diving was how we did all our diving around Koh Phangan originally and we still welcome the chance. It’s quick and easy, leaving straight from the back of the dive centre in Chaloklum and you have your own choice of a wide variety of local dive sites. We can agree on dives that are suited to your ability and where conditions should be best. Don’t forget suntan cream and a sensible hat! Night Diving is from our dive shop at Mae Haad Beach or as part of a boat diving trip. We usually take you diving at a familiar dive site, but it will be a completely different feeling from that of a day time dive, with the chance to see stingrays out and feeding, sleeping fish, various prawns and crabs, colourful featherstars, sea cucumbers and squid. There’s also the possibility to experience the amazing bioluminescence!